SP: Media Networks has already selected a vendor for its baseband Ka-band platform. What were the main considerations behind the decision? Planas: To select our technology vendor we used a comparison matrix with over 20 attributes. Among other key aspects, we evaluated uplink and downlink bits/Hertz, power consumption, space requirement and experience with VSAT solutions for a high number of residential subscribers. What will be the coverage and capacity of this high throughput satellite (HTS) broadband network? 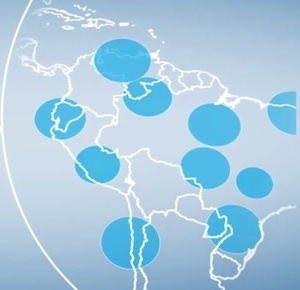 Planas: We count with 9 beams of 125,000 sq Km (48,000 Sq Mi) distributed in territories of Mexico, Brazil, Argentina, Chile, Colombia, Ecuador y Peru. Total capacity is 15 Gbps. 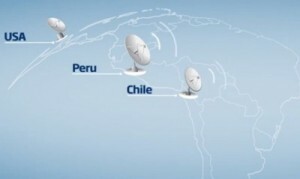 The project includes the two first gateways in Laredo, TX (US) y Arica (Chile) which are managed from our regional Media Networks teleport in Peru. SP: Media Network´s approach towards Ka band could serve as an interesting leading case given key differences with large networks deployed in North America and Europe. Instead of deploying a high-throughput satellite fully dedicated to broadband services, MN is hosting a limited number of transponders on the Amazonas-3. Although this approach exposes MN to lower risk by incrementally matching demand and supply, it also raises some questions. We wonder if a limited number of HTS beams on the Amazonas-3 means a cost per transponder that is substantially higher that that of large HTS networks. Planas: A difference with Ka-band experiences in the US and Europe, where projects have pursued regional coverage, is that we have opted for a different path: concentrate capacity where there is demand. This will allow us to evolve with the service and avoid what happens in the US and Europe where the busiest beams tend to subsidy those with lower traffic demand. SP: In your view, how important is it to be a first mover in HTS and how relevant would it be for MN to retain such leader position? Planas: Media Networks always bets on innovation. Along these lines, it is not the first time we are disruptive in this market. A few years ago, when we started off as a wholesale distributor of DTH we were also the first and time has proved we made the right decision. We are now pioneering wholesale distribution of residential satellite broadband, which is something new in the region. We are approaching this new enterprise with the same spirit and, just like what happened in the wholesale DTH market, we believe this initiative will have a positive impact on the lives of millions of Latin American people. SP: For Internet and broadband access, MN has expressed interest in adopting a white-label, wholesale distribution model similar to the one adopted for its video offering. How will this will work? Will satellite service providers and telcos in the region be able to brand their own services? Planas: At Media Networks all our wholesale solutions are “white label”, allowing operators to focus on the product definition and management of all commercial variables (brand, pricing, billing etc.) leaving everything else to Media Networks. This is the reason why we claim to be the best strategic partner of pay TV operators and satellite service providers. We offer integrated solutions that are implemented with industry´s best time-to-market and are adapted to each operator´specific needs. SP: What applications are envisioned to be transported over MNLA´s HTS network? Planas: The Ka-band solution we are developing is geared towards offering Internet access, and thus any type of application found in the www can run over it. SP: Any other information that you would like to share? Planas: We believe that the Ka-band solution we are developing has enormous potential to make broadband access truly universal in Latin America, complementing the coverage of existing fixed and mobile networks. In territories like those in the region, with vast geographic extensions and low population density, the satellite platform offers many advantages and is called to take a key role in this great effort.